U.S. payrolls rose by 151,000 last month, below the expectation of 180,000, while the jobless rate held steady at 4.9%. This in combination with weakness in yesterday’s Purchasing Manager’s Index (PMI) report for August showing a slowdown in manufacturing activity reduces the likelihood of a Fed rate hike at its September 20-21 meeting. 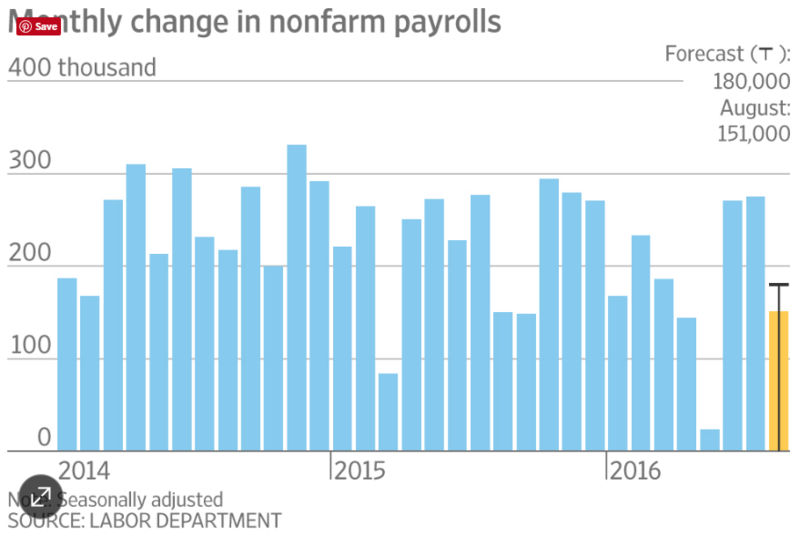 The average payrolls gain over the last three months of 232,000 is well above the roughly 150,000 average that prevailed over the first five months of this year. This slower, but still solid, pace of job creation is sufficient to sustain growth at an above-potential rate. Recent expenditure data, including the strong July trade numbers and construction data reported this morning, are pointing to Q3 GDP growth of 3.2%, a substantial rebound from the very weak growth in the first half of the year. U.S. labour markets remain very close to full employment as some companies report having difficulty finding workers. Average hourly earnings increased moderately last month with a dip in average hours worked posing a bit of concern, although the modest decline could be a statistical aberration. The labour force participation rate, which indicates the share of the working-age population that are employed or looking for work, was also unchanged at 62.8%, an historically low level. Data released this morning for Canada showed a long-awaited decline in the July trade deficit to $2.5 billion from a record $3.97 billion in June as exports jumped by 3.4% and imports remained unchanged. The export gain was led by broadly-based strength outside of the energy sector with 9 of 11 sectors reporting increases. There were healthy gains in motor vehicles and parts, metal and non-metallic mineral products and transportation equipment. The dip in imports in July, although positive in an accounting sense for the net trade balance, was somewhat more disappointing, particularly a pull-back in industrial equipment imports that, if sustained, would bode poorly for business investment in the quarter. Net trade will make a strong contribution to third quarter growth in Canada, which is poised to post a dramatic recovery from the 1.6% (annualized) decline in Q2 that was led by the wildfires and disruption in oil production. Though the Alberta disruptions were a major contributor to the economic contraction in the second quarter, net trade was also a significant dampening factor reflecting a decline in both energy and non-energy exports. For Canadian growth to be sustained at a solid pace going forward, the Bank of Canada has long expected a revival in trade activity only to be disappointed by five consecutive months of deterioration in this sector. Finally, the July data suggest the long-awaited improvement might be upon us. Non-energy exports are still below year-ago levels, but the gain is nonetheless very encouraging and could well foreshadow a much-needed improvement in non-energy business investment that would set the economy on a sustainable above-potential growth trend.